 Meeting Notes and FREE Theatre Tickets !!! Thirty people attended our January 29th meeting and heard Dr. Michael Harvey speak about the Psychology of Hearing Loss. If you were unable to attend would like to review the information, here it is: Psychology of Hearing Loss, Beautiful tree but alone, Outrage, airplanes, and chandeliers. Thank you to Tom Cummiskey of the Plymouth Public Library for making copies for the meeting. Our next bimonthly chapter meeting will be Tuesday, March 26 – a Rap Session. It will be from 5:00 to 6:30 pm with an optional dinner at a nearby restaurant afterwards. Contact Sandy Spekman (sspekman@gmail.com) ASAP for tickets. 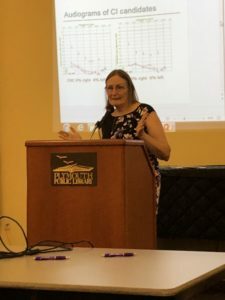 For those of you who missed Saturday’s meeting on Hearing Assistive Technology 101 with Ellen Perkins, an excellent speaker (or for those of you who attended but want to review this information again), for Ellen’s slides please click here. Highfield Theater 60 Highfield Dr. The Spire Center has given us permission to provide open captioning on Friday, December 21 at 8 pm for Divas With A Twist, but we do not have a confirmed CART reporter for this event yet. A request has been put in with the Massachusetts Commission of the Deaf and Hard of Hearing. Details will be forthcoming. A meeting of the Plymouth Chapter of Hearing Loss Association of Plymouth, serving people with hearing loss on the south shore, Cape Cod, and the Islands was held at the Plymouth Public Library on September 26th. 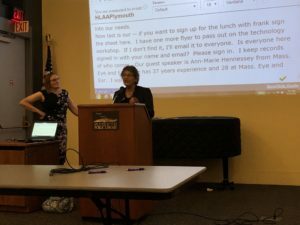 Thanks to the Plymouth Public Library Corporation and the Plymouth Lions Club for sponsoring the meeting’s CART (Communication Access Realtime Transcription). New information cards were distributed at the meeting. Click here for a .pdf file of the information card. There were approximately 25 attendees. The guest speaker was Ann-Marie Hennessy, Au, CCC-A from Massachusetts Eye and Ear Infirmary, who spoke about cochlear implants. Her talk included descriptions of criteria for deciding if an implant is indicated, what the surgery is like, and what to expect during recovery. If you missed the presentation or would like to review the information, click here for the PowerPoint presentation. Photos from the meeting are below showing chapter president, Sandy Spekman, introducing guest Ann-Marie Hennessey and Ms. Hennessy during her presentation.